This site was developed as simple and affordable way for people to buy limited-edition fine art prints from a range of skilled artists. 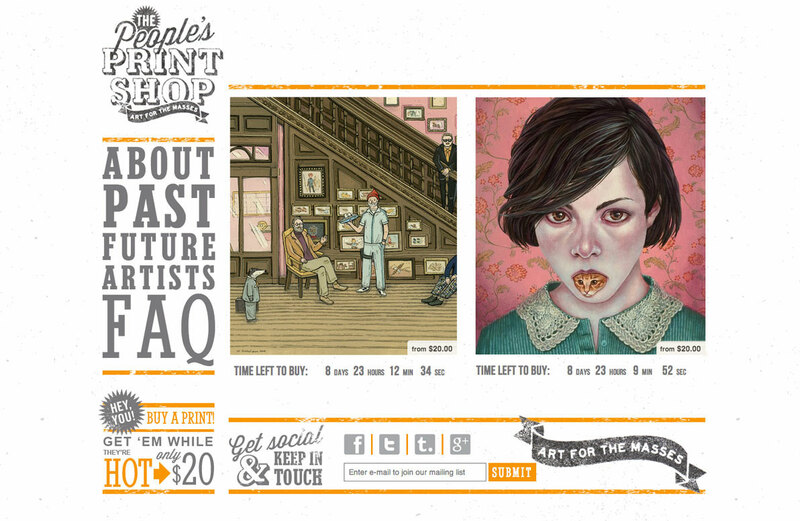 It typically features two prints at a time, each highlighted on the home page with its own timer that shows visitors how much time they have left to buy it. The owner’s end of the site allows him to set start and end times for each item and upload a set of photos to show them off from different angles. Fine art for the masses. That’s the goal at the People’s Printshop. They believe that every man, woman, child and cat should be able to purchase amazing limited edition art prints by some of the world’s leading contemporary artists. Their fine art giclee prints come on a luxurious 300# Italian cold press watercolor paper, and are always printed with archival Epson Ultrachrome HDR inks. Their screen prints are lovingly printed by hand, and all of their printing is either done in-house, or at the very least, here in the good ol’ U S of A.